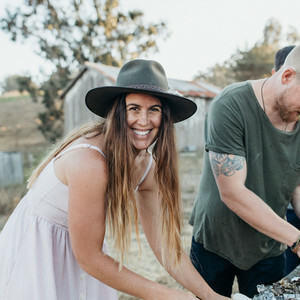 For 16 years, Sarah Glover has made a career as a chef in Tasmania, Sydney and New York. These days she is rarely found in a kitchen—the outdoors is where she applies her trade now. Her work has been published through her cookbook, "Wild Adventure," and featured in Cherry Bomb, New York Times, and Delicious Magazine. RV-friendly recipes that will take your road cuisine to the next level. 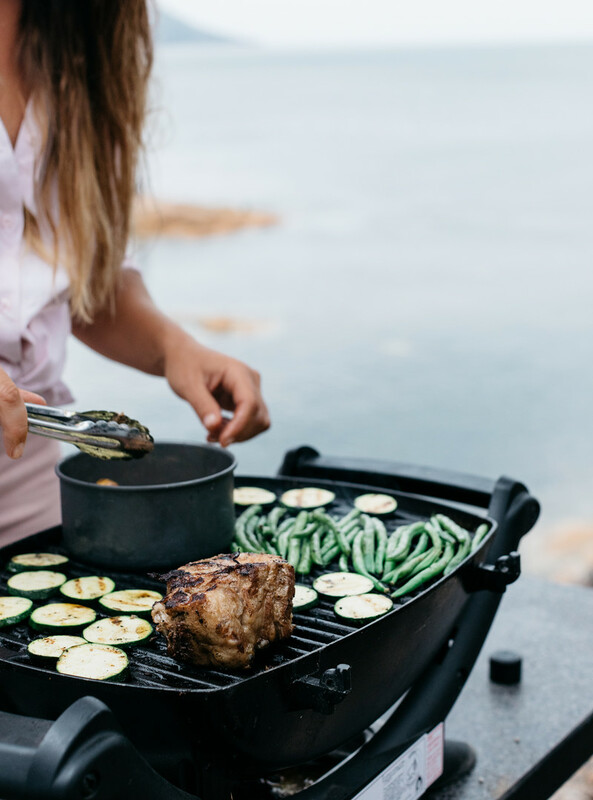 Sarah Glover, Australian chef and cookbook author, shares her genius take on delicious meals you can make wherever you go. 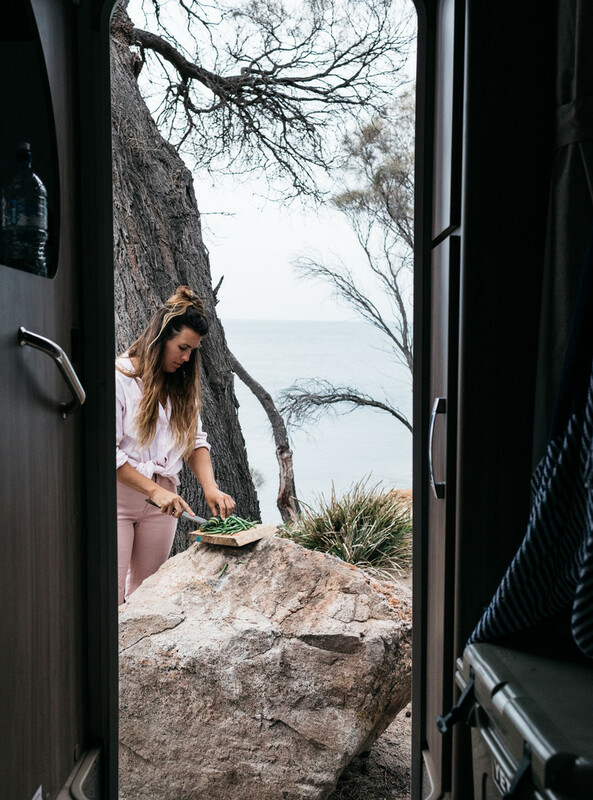 Follow along as she shares delightful meals, breathtaking views of Tasmania and a taste of the wild. Poaching pork might sound a little odd. Why poach? Why not just roast it? I love the idea of injecting flavor into my meat and I found this recipe to be an easy way to do this. You don't need a oven to make it. 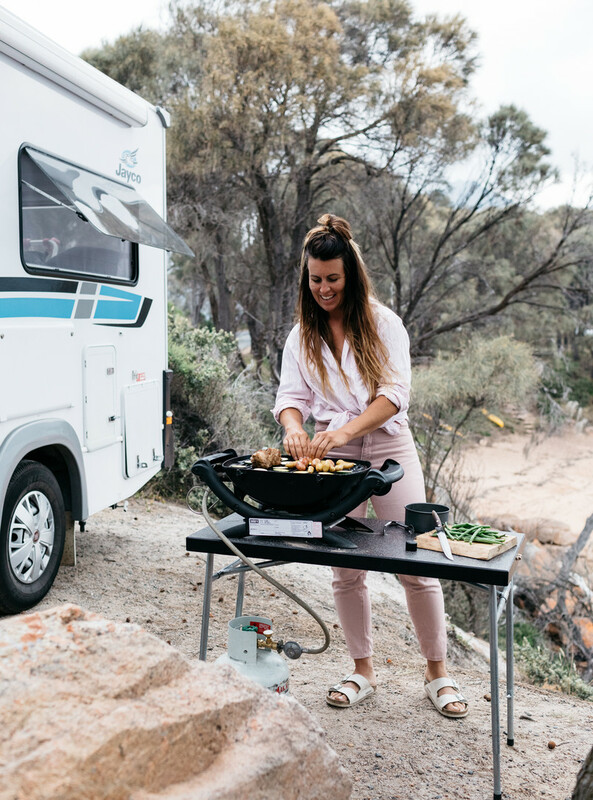 You can do it before you set out on your daily adventure or just simply let it cook while you read a book in the comfort of your RV. This is our version of granite countertops. 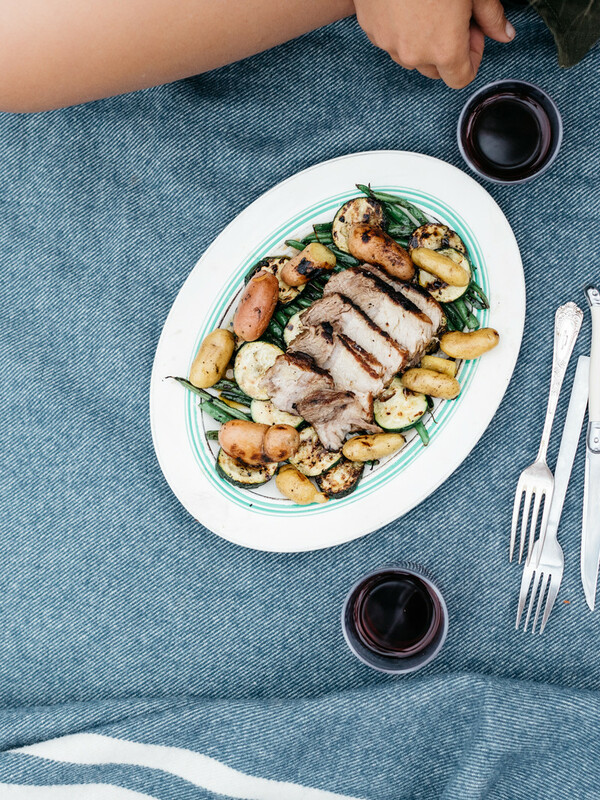 The perfect meal for outside grilling, but it would be just as tasty made inside on a rainy day. Place a medium saucepan or Dutch oven on the stove (or burner), or in a fire. Add a drizzle of olive oil and brown the pork neck on all sides over high heat. Add the onion and apple, and the chicken stock and cider. Cover with aluminium foil and the lid, then reduce the heat to low and cook for 2 hours or until the pork is tender. Add the potatoes and cook until they are soft but not falling apart. (The cooking time will depend on the size of your spuds). Light your grill. Toss the beans and zucchini in a little olive oil, and cook on a grill plate until just tender and slightly blistered. Add the potatoes and pork to the grill and let them get a little charred too. Remove the pork and let it rest for a few minutes, then cut into slices and season with salt. Transfer the vegetables to a serving plate and arrange the sliced pork on top. Place the potatoes around the pork and over the greens. Serve with mustard and a glass of your favorite wine. 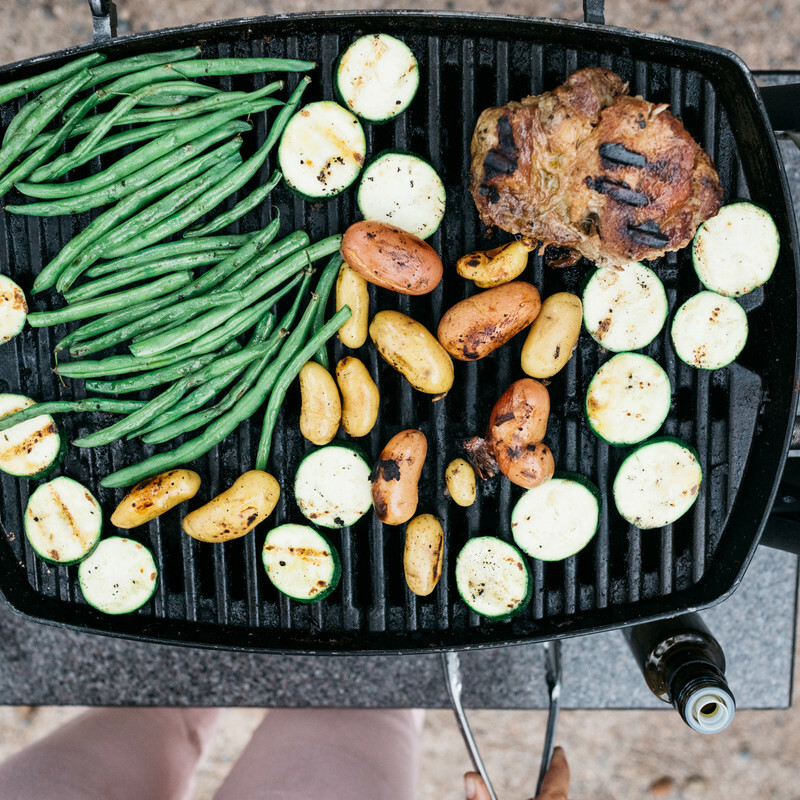 This recipe is so easy to throw on the grill--only the zucchini need to be sliced. 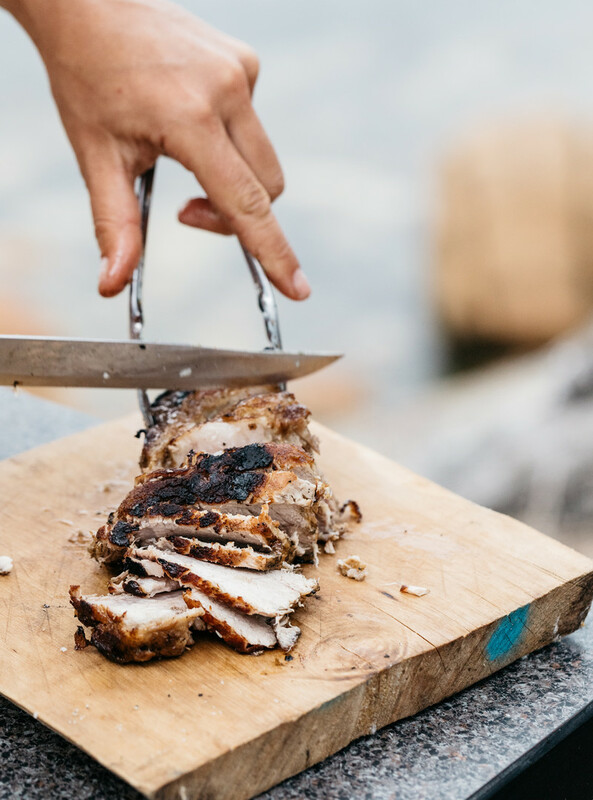 Go wild and put your saucepan right on the grill to poach the pork. Make it easy on yourself. Slice for easy serving and presentation. Yum.